The Finnish architect and designer Eero Saarinen distinguished himself in several ways during the mid-century period, making him one of its most important figures. His early years were characterised by consistent alternation between Europe and America. Born in 1910 in Finland to the famous Finnish architect Eliel Saarinen, he emigrated with his family to the US in 1923. The younger Saarinen returned to Europe for his studies in 1929, taking up sculpture at the Académie de la Grande Chaumière in Paris. Before returning to America to study his father’s trade at Yale until 1934, he once again went back to Europe on a Yale scholarship, only to return to America to work and eventually take over his father’s architectural practice in 1950. 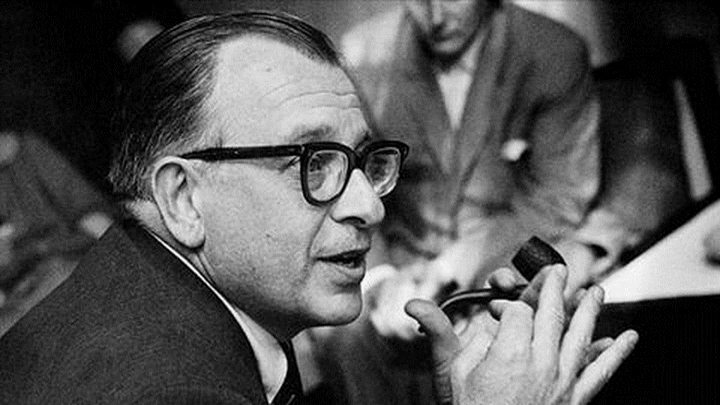 It was after this period of transience, that Eero Saarinen first met Charles Eames. The two co-developed a host of new furniture forms, including the first designs incorporating moulded laminated wood. 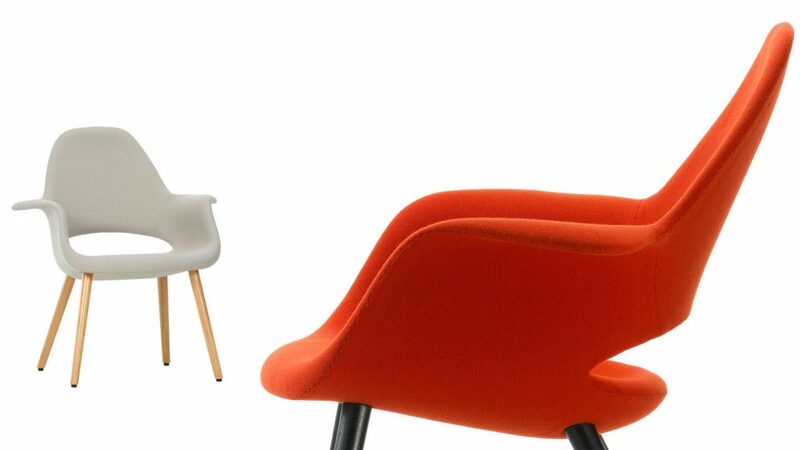 The two diverged after Saarinen began exploring new innovative materials. As well as furniture, Saarinen contributed several masterpieces of the American modernist architecture period, most notably the TWA Terminal at New York’s JFK airport and the Dulles International Airport in DC, designed just before his death in 1961. Perhaps Saarinen’s most renowned furniture design, the Womb Chair was designed in 1946 at the request of Florence Knoll, head of the Knoll Furniture Company along with her husband Hans. 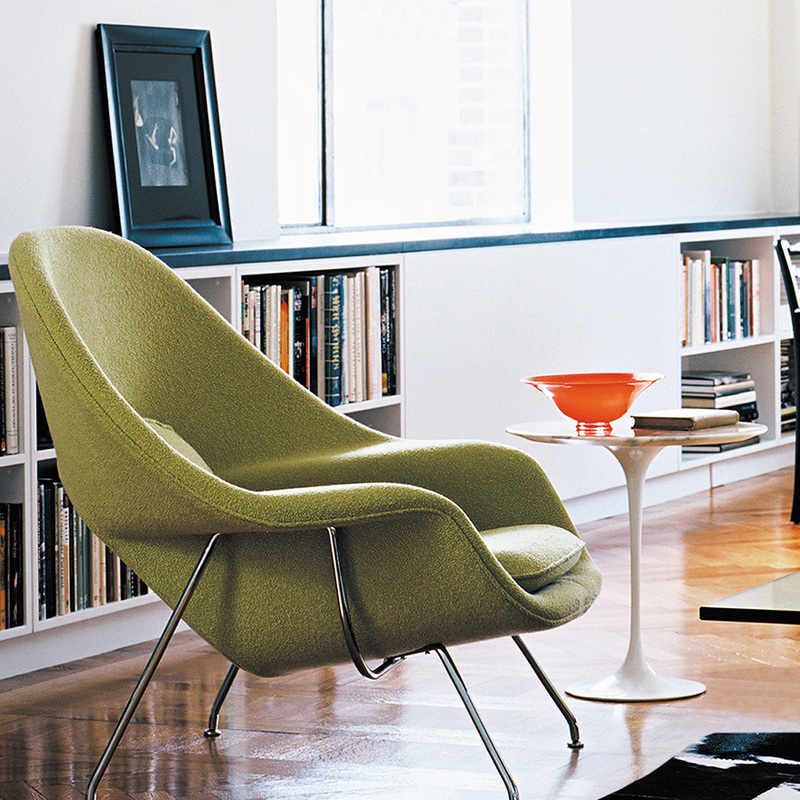 Produced by Knoll since 1948 it is a truly beautiful specimen. But while the beauty of its form is not in question, like all good modernist designs, its functionality still remains at the forefront. The specific function, as laid out in Knoll’s request, was for “a chair that was like a basket full of pillows.” The complex organic structure that comprised Saarinen’s response caused the design to be the first mass-produced fibreglass chair in America. Saarinen’s Organic Chair was developed in collaboration with that other great furniture designer Charles Eames, in anticipation of the “Organic Design in Home Furnishings” competition, which took place in 1940 and was organised by the New York’s Museum of Modern Art. Alas, the technology was at that time not in place to enable such an organically-shaped design to reach a mass market. However, off the back of the designer’s initial foray into fibreglass technology in the Womb Chair, it was finally brought into production in 1950 through another innovation of a laminated seat shell coupled with polyurethane upholstery.